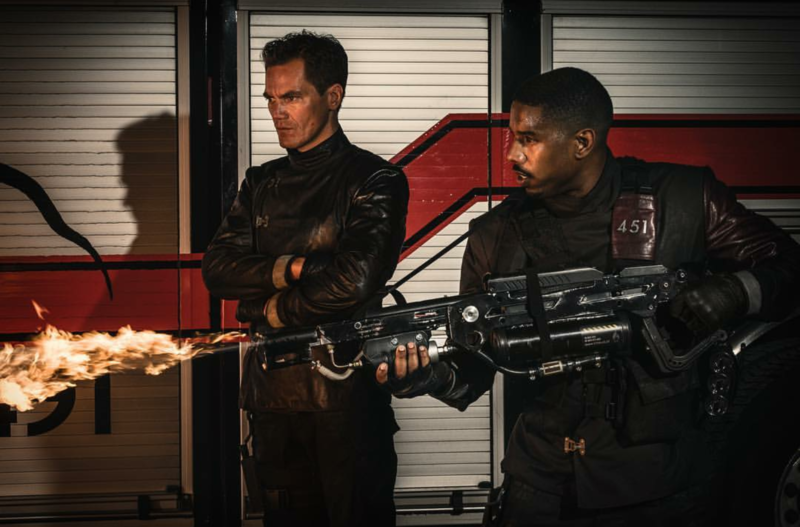 Creed star Michael B. Jordan and Oscar-nominated Michael Shannon have been set to star in Fahrenheit 451, the HBO Films adaptation that has been in development at the premium network. The latest movie version of Ray Bradbury’s iconic sci-fi novel is being directed by Shannon’s 99 Homes helmer Ramin Bahrani, who co-wrote the script with his 99 Homes co-scribe Amir Naderi and is executive producing. The dystopian novel, originally published in 1953, depicts a future where media is an opiate, history is outlawed and “firemen” burn books. Young fireman Montag (Jordan) forsakes his world, battles his mentor Beatty (Shannon) and struggles to regain his humanity. I've never read the book, but surprised to see it was published in 1953. I assumed it was older than that. That looks pretty cool.... Jocleyn read the book last summer I think, she's so smart. I've read the book too. I want to feel special. DannyFanny wrote: Source of the post I've read the book too. I want to feel special. I will watch this and I will not read the book first. The ladies here will like this. Watched tonight. I didn't know anything of the source material, but the movie felt very familiar. Turns out Equilibrium with Christian Bale is based on Fahrenheit 451 in some pretty major ways. I enjoyed F451 and don't understand where all the hate of it came from. It wasn't the most amazing movie, but I was entertained throughout and thought MBJ and Shannon were great. The ending was a little cheesy, but overall I'm glad I watched. I wish we learned more of the world as well, we only really got to see life of a fire fighter and the girl with no identity. What about average citizens? I think a lot of the complaints came from people who were familiar with the book and original movie. Since I had no frame of reference I didn't care that Montag's wife was left out for example. A lot was changed from the book to this movie. Montag's wife would have given you an insight to the average citizens. In the book, they are just mindless, TV junkies. The movie kind of portrays the average citizen by the comments and emotes of the fans during the Firemen's raids and burnings. Equilibrium is essentially Fahrenheit 451 but with more gun kung fu and pertains to emotions instead of books. DannyFanny wrote: Source of the post In the book, they are just mindless, TV junkies. The movie kind of portrays the average citizen by the comments and emotes of the fans during the Firemen's raids and burnings. We had a quick scene of them maybe being addicted to VR, but that just raised more questions. DannyFanny wrote: Source of the post Equilibrium is essentially Fahrenheit 451 but with more gun kung fu and pertains to emotions instead of books. Ahhh. I watched this within the past couple of years and remember the death scene with Sean Bean holding a book. I thought books were outlawed, bu I couldn't remember specifics. Tyler wrote: Source of the post Ahhh. I watched this within the past couple of years and remember the death scene with Sean Bean holding a book. I thought books were outlawed, bu I couldn't remember specifics. Only reason I know this, is because I just listened to a podcast about it. Best Bad Movie Ever, former Cracked writers and usually a guest discuss a different movie each week. One person defends the movie while the others explain why it isn't a good film. And I will be adding that to my podcast app... Thanks! The first 2/3s of this movie were REALLY good and then it just took a horribly drastic downturn and ended on a really stupid note. What if that stupid bird doesn't fly to Canada? What if it gets eaten? Didn't they reveal that osmisissions (can't remember the O word) was just people memorizing a book? Was the DNA thing real? I didn't get that part. Why would they have all of it on DNA but then ALSO memorize them? Seems pointless to me. The end left me confused. DannyFanny wrote: Source of the post Only reason I know this, is because I just listened to a podcast about it. Best Bad Movie Ever, former Cracked writers and usually a guest discuss a different movie each week. One person defends the movie while the others explain why it isn't a good film. I liked Equilibrium a lot!!!! I was too. So that kid memorized a million books and his DNA was put in a bird? Or what was happening? Tyler wrote: Source of the post I was too. So that kid memorized a million books and his DNA was put in a bird? Or what was happening? Lol i have no idea. THey should have not had the bird and then the good guys would have lost.